Since March 2011, when the nuclear accident occurred at the Fukushima Daiichi Nuclear Power Station, the contamination of food produced in Japan by radioactive substances has become an important issue. From the time of the accident to the end of March 2012, the Japanese government controlled distribution through the application of “interim standards” of radioactive cesium detected in food products. In April 2012, these were eliminated in favor of lower “new standards” (see Table 1). In the case of rice, beef and soy products, however, a long grace period was allowed. In the case of rice, Japan’s staple food, for example, the interim standards were applied for rice produced up to September 30, 2012. In June 2011, we were greeted by the news that a shipment of Japanese green tea produced in Shizuoka Prefecture had been refused entry into France when the French customs detected over 1,000 Bq/kg of radioactive cesium in the tea. It is quite probable that many people, both inside and outside Japan, gained the strong impression that tea produced in Japan is dangerous. The November 2012 edition of the TanimuLab. LETTER series, posted each month on CNIC’s Japanese website, took up the issue of the radioactive cesium concentration in teas (matcha – powdered green teas) that are being distributed from the different producing areas. In the article, it is stated that of six samples labeled as originating from different producing areas, radioactivity was detected in three samples (one of which is suspected to be a blend of tea leaves from several different producing areas). This article drew a great deal of interest and we are receiving more than the usual numbers of enquiries about it, not only from people within Japan, but also from overseas. I would like here to give an explanation of the realities of the situation regarding the radioactive contamination of Japanese teas following the Fukushima nuclear accident based on data published by the Japanese government and the prefectures. Figure 1. Japanese Tea-producing Areas, FY2011. roughly 200km southwest of Fukushima Daiichi Nuclear Power Station. Since it is thought that of all the Japanese tea-producing areas Saitama Prefecture is most affected by the Fukushima nuclear accident, the following discussion will focus on data from Saitama Prefecture. Tea subject to shipping restrictions during FY2011 (April 2011 to March 2012) due to the interim standards on radioactive contamination being exceeded was produced in Ibaraki, Kanagawa, Chiba and Tochigi Prefectures. The Shizuoka tea factory that produced the tea that was blocked by the French customs on June 22 was asked to exercise “voluntary restraint” by Shizuoka Prefecture and was not subject to “shipping restrictions.” Only six days later, on June 28, nibancha (new tea leaves that grow after the leaves have been picked once, around six weeks later than the first picking) from this factory and tea leaves from subsequent pickings were confirmed to be safe (less than 500 Bq/kg) by prefectual authorities and the voluntary restraint on shipping was lifted. Further distribution of ichibancha (first picking) from the factory was then allowed to proceed only for tea which was confirmed to be safe by prefectual authorities. On August 5, it was announced that testing had been carried out on ichibancha produced by 20 tea factories in the area where the factory mentioned above is located, and radioactive cesium exceeding 500 Bq/kg was detected in tea from five factories. The average contamination was 444 Bq/kg. Shizuoka Prefecture then requested that these five factories exercise voluntary restraint on the shipping of the tea and carry out a voluntary recall of the tea that had already been shipped. The Ministry of Health, Labour and Welfare (MHLW) ran radioactivity tests on distributed teas, announcing on September 2 that radioactive cesium had been detected in tea produced in Chiba Prefecture (2,720 Bq/kg), and Saitama Prefecture (three samples, 1,270 Bq/kg, 1,530 Bq/kg and 800 Bq/kg). On September 5 it was again announced that radioactive cesium had been detected at a level of 800 Bq/kg in tea produced in Saitama Prefecture. 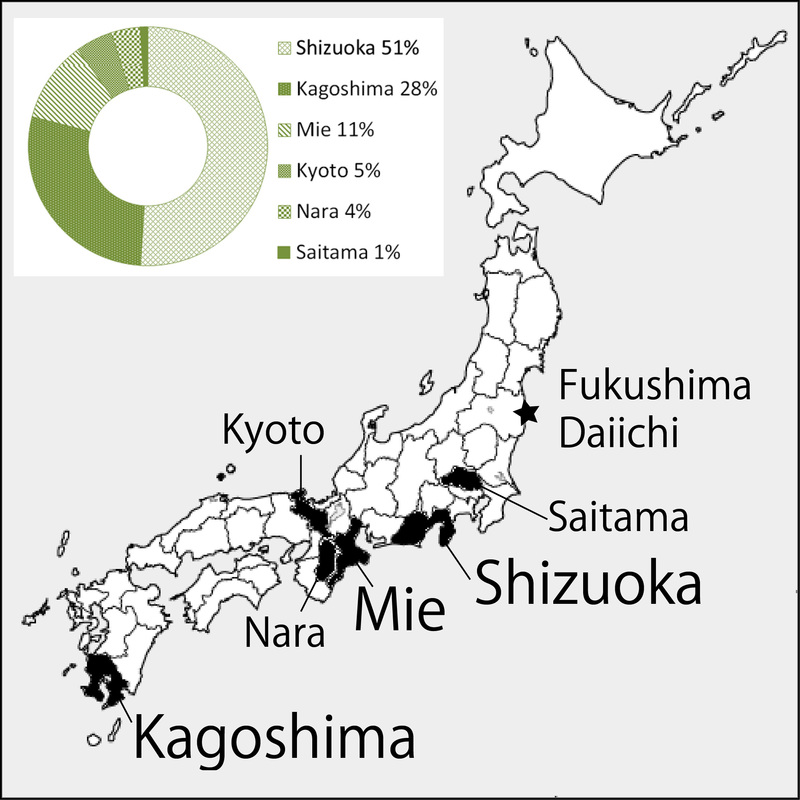 The fresh tea leaves produced in Japan’s second largest tea-producing area, Kagoshima Prefecture (southern Kyushu) contained radioactive cesium at a level of 0.12 Bq/kg (July to September 2011). In the third largest producing area, Mie Prefecture, it has been announced that 10 Bq/kg or less of radioactive cesium were detected in two kinds of dried tea leaves. We can therefore assume that tea produced in any area west of Mie Prefecture has not been contaminated to any level that would pose a problem in deciding whether to ship or not. The demarcations used by the government for areas from which shipping is restricted are said to be “In principle prefectures, but may also be divided into several blocks within a prefecture if management is possible by the prefecture, city, town and village administrations.” At the same time, Saitama Prefecture and Shizuoka Prefecturet ested teas produced in their prefectures according to producing area and brand, making judgments on whether or not to ship on the basis of smaller geographical areas. This is thought to have occurred because these prefectures are major teaproducing areas, and this was therefore a measure to contain economic losses to as low a level as possible. Especially the fact that “voluntary restraints” and not “shipping restrictions” were imposed was an attempt to protect the brand image of the tea. the background who might have looked at this MHLW website in order to research the situation of the radioactive contamination of tea might have formed the mistaken impression that teas from Shizuoka and Saitama Prefectures were not or had not been contaminated. Information concerning the voluntary restraint of shipping was only posted on the prefectural websites. In FY2011, tea in the form of dried tea leaves was used for radioactive contamination testing. 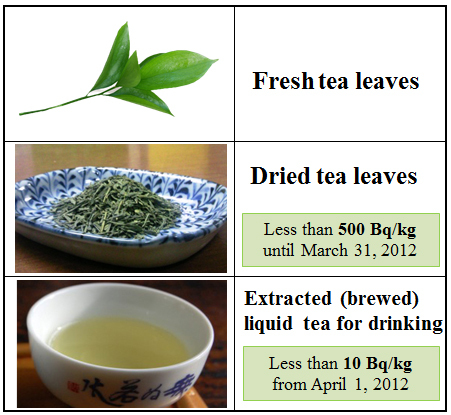 As noted above, the weight of the tea is reduced 80% when processing the tea from fresh tea leaves to dried tea leaves. Since the standards for regulations on radioactive substances is expressed as a value per unit weight, if the weight is reduced to one fifth, then the concentration of radioactive materials per unit weight must jump five times. Possibly the reason why the radioactive contamination of tea was more serious than other kinds of leafy foods such as vegetables is that the same standard for radioactivity (500 Bq/kg) was applied to tea despite the fact that tea undergoes a drying process. Tea is included in the category for ‘drinking water under the new standards introduced in April 2012. Because of this, it is now required that tea in the form of liquid brewed tea for drinking contains 10 Bq/kg or less of radioactive cesium, and the levels of radioactive cesium in dried or manufactured teas are no longer questioned. 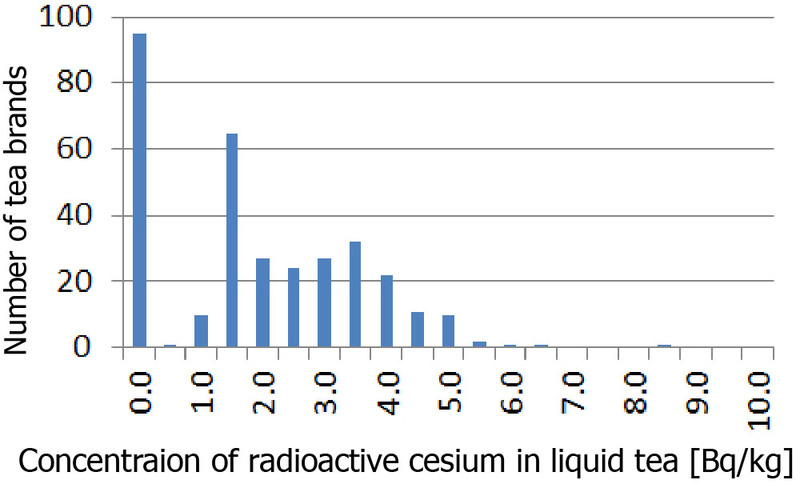 According to official announcements on actual extraction (brewing) experiments carried out by MHLW, 270 Bq/kg of radioactive cesium contained in dried tea becomes approximately 5.2 Bq/kg when extracted (brewed) as tea for drinking, a 98% reduction of the concentration of radioactivity per unit weight. How has the concentration of radioactivity in tea changed from FY2011 to FY2012? levels announced by Saitama Prefecture for liquid tea for drinking, all 329 samples were below the standard (Figure 3). 50 times that of liquid tea for drinking, then the concentration of radioactivity in the dried leaves would be distributed over a range centered on 100 Bq/kg. It would appear that the center of the distribution of radioactive cesium fell from around 200 Bq/kg in 2011 to around 100 Bq/kg in 2012. Even now the dried teas contain amounts of radioactive cesium that can be easily detected. foodstuffs, and therefore unless some unforeseen even occurs, no tea exceeding the standards will appear. I have not discussed it here, but since the standard applied to powdered matcha is that of general foodstuffs (100 Bq/kg), it is quite possible that products exceeding the standard will appear. People’s interest in the contamination of foodstuffs is naturally high, and we would like to call for the enhancement of the testing system and thorough information disclosure. I believe that this should not be left simply up to the administration to carry out, but that continual monitoring by citizens is also necessary.